Some are scary, some are old. A funny rhyme is a good thing to start speaking about rather serious things. This time it’s going to be hair growth cycle and its stages. So why in the world do we have to take care of our hair? To go to hairdressers every month or so, to think of stunning hair styles on special occasions, to wash, comb and brush our hair? To smell and touch (if not to chew) it? And why do we pity the bald ones after all? Because it grows… and falls out. Yeap, it grows and falls out all the time. That’s what keeps the whole process going. The common rate of hair growth is about a half of inch a month. All in all, there is about a hundred thousand hairs growing on the average head. 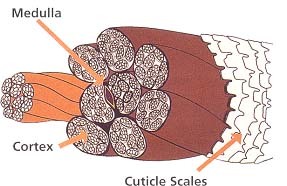 Hair grows from the dermal papilla (the bottom of the hair root), which produces new cells for hair growth. 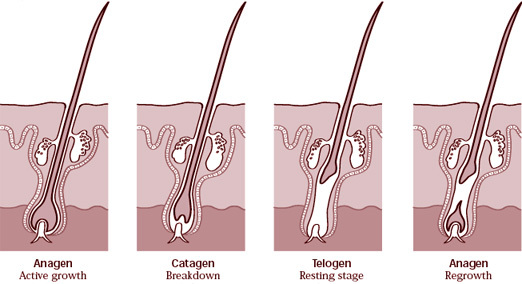 These cells are initially soft, but they are hardened as they come out to the scalp’s surface. Each hair usually has a life cycle of one to seven years. Why so? Because each hair follicle sooner or late enters a period of rest. And what actually happens at the moment is that the hair simply falls out forever. Yet to be replaced and regrown by another one, which is going to go through the same cycle of 1 to 7 years of growth. None are hairy, all are bald! As with three types of hair layers, there are also three types of hair that can be found on our bodies. Amazingly, when we were even far from being born we already had hair on our skin. This hair is called lanugo hair and it is only found only on human fetuses. This is the thinnest type of all. Another one is the so called vellus hair. It currently grows on our body. Comparing to lanugo hair, this type is a little bit thicker, but has the same structure. Finally, terminal hair is the third type. It is the thickest and strongest of all and, as you have probably guessed, it makes up our heads of hair, beards and moustaches, eyebrows and lashes. All our hair is dead, if we can put it so. Well, not really, of course. But what’s for sure is that it has no nerve endings inside. So it never hurts when our hair is cut through, ruled, treated, permed, bleached, dyed or whatever. Though, we can feel when somebody pulls our hair. What’s the trick here? The thing is that our hair is rooted in the scalp and it is more or less toughly sitting (how toughly – depends on the hair and scalp condition) in a small sack called the hair follicle. Nerve endings connected to the hair root unmistakably tell us when our hair is being pulled and whatever. Everyone being cold or frigtened at least once had goose-flesh. This interesting experience can be explained by the activity of arrector pili muscles, which are attached to the hair root and squeeze together to pull the hair straight on such occasions. 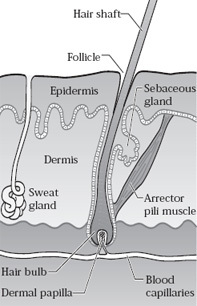 One more thing that is found attached to the hair root and follicle is the sebaceous gland. The function of it is to produce natural oil (lubricant) for hair called sebum. When too much sebum is produced, the scalp and hair will be too greasy, and, on the contrary, too little sebum will make the hair and scalp dry and lifeless. We also know the unpleasant word seborrhea that stands for a headskin diosorder that affects the sebum gland. Well, lets take a closer look at our scalp. Actually, it is has the outer and the inner layers. The epidermis is the outer, protective layer. As a matter of fact, it is constantly renewing and shedding itself. So, there is one more unpleasant word dandruff that stands for another disorder when the epidermiss is being renewed too excessively. The dermis is an inner layer of the scalp that is thick and complex as regards its structure and constituents. In reality this is the place where all hair follicles, nerve endings, sebaceous and sweat glands, and blood capillaries and vessels are found. Our hearts pump blood that brings essential nutrients and oxygen to the dermis, while its blood capillaries and vessels push blood further into hair follicles to feed the dermal papilla. Here is a simple rule: the more blood goes towards the hair papilla, the more our hair will grow.